We are small with only 6 total apartments on this property. There are 3 separate Duplexes with 4 -one bedroom and 2- two bedroom apartments. We are a gated complex which offers our guests peace of mind. Our neighborhood is very quiet and we are located close to Tucson Mall, many restaurants and stores. Central location to majority of attractions including our famous Gem Show. There is a patio in front of each apartment with its own BBQ Grill. We are a husband and wife team that not only manage but we built the units. We are Tucson natives, and would love to help you make the most of your stay. We will do everything we can to make your stay the best we can. Come enjoy the many outdoor activities that abound, or just enjoy sunny Tucson. If you are looking for a quiet, home away from home, this is it. We are NON Smoking and sorry no pets. My husband and I are natives of Tucson and have always loved what Tucson has to offer. In 1994 we purchased this property as bare land and proceded to design and then build 3 separate duplexes as rentals. Over the years we have rented them to long term tenants unfurnished and then we decided to the apartments furnished units so we could share with visitors what Tucson has to offer. This is a great way to meet so many people from so many different parts of the US and other countries. We dont live on the property but we are only 10 minutes away and are generaly there daily. When we saw the property we knew right away that the location was perfect. With the main North and South rd (Oracle Rd) within walking distance for public transit, shopping, restaurants and so much more it is perfect for our tenants. Although it is so close to a main rd you can't hear road noise from it so you can enjoy the patios. We are close to Downtown Tucson, the University of Arizona, Tucson Mall for shopping, Numerous hospitals, Rillito river park for biking, running and walking,Gem and Mineral show, access to I-10 and so much more. Our apartments are quality built with sound proofing between units so each apartments is very quiet. Tucson Mall is 1 mile away for shopping and dining, convenient to bus lines, numerous hospitals within 2 to 3 miles, farmers market on Sundays only 3 miles away, close to Trader Joes, Sunflower markets along with Safeway, Frys, Super Target 1 blk away, easy access to I-10. There are so many things around us that I can not list them all. We are 3 miles from downtown Tucson which offers theaters, many restaurant, art district and more. From patio facing north nice views of the Catalina Mountains. Full size washer/dryer in each apartment. Directly in front of apartment. Includes all appliances, microwave, coffee maker, blender, toaster, various cooking accessories, dishes and silverware. Each apartment has its own front patio with table and 2 chairs to enjoy our weather. We are now a completely gated complex with automatic security gate. This was my second stay at the Pastime Suites, the first being five years ago. I must say that Cindy and Gregg have done a great job of maintaining the premises. It is as nice now as it was then. The unit was clean and well-equiped. Everything is as described in the listing. Also, it is convenient to downtown, the university, I-10, shopping, dining, and activities. For an extended stay in Tucson, it would be hard to beat. Cindy and Gregg are also super hosts, responsive, and easy to deal with from start to finish. I hope to rent from them again. Where do I begin? My entire stay in Tucson was working for my company. I needed everything since I didn't know how long I would be here. The house was close and convenient to my office. It was fully furnished....and I mean fully! Pots, pans, dishes, ironing board, iron, plates silverware...you name it, it was there. The only thing I had to buy was consummables. The landlords were the nicest people I have ever met while travelling for my company. They made the entire process effortless. This was the easiest, most convenient stay I have had to make travelling for my company. It was such a pleasure that should I ever return to Tucson for vacation, I will definitely be contacting them again. Very seldom do you stay in a place where you immediately feel at home. But we did here. The condo is well equipped, clean and comfortable and the weather was wonderful. So much to see here, we were busy touring all the sights - Pima Air & Space Museum, Titan Missile Museum, Tombstone, Bisbee and Kartchner Caverns. Recommend lunch at the Tucson Tamale Co. and supper at Guadalajara Restaurant. Cindy and Greg are great hosts. Definitely stay here again. Pastime Suites felt like a home away from home complete with two wonderful owners. From the first email to the move-in experience and everything after that, they could not have been more professional, responsive or helpful. 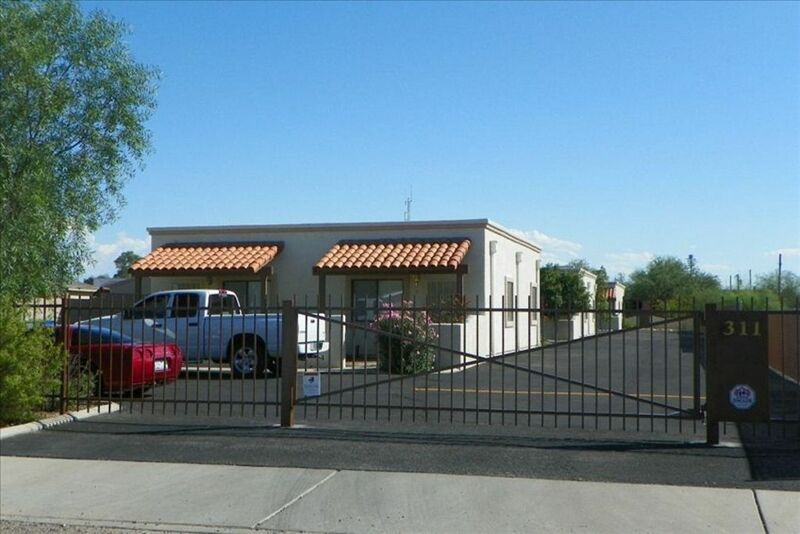 They said that they wanted to build in an ideal location in Tucson that is close to everything, and it's clear that this property was the right choice. Places close by include Mimi’s Café, Jason’s Deli, Olive Garden, many other restaurants, UPS, Fry’s, Sunflower and Sprouts Markets, Walgreens, Walmart, Home Depot and Super Target. Any other stores can be found at the nearby Tucson Mall. Jacob’s Park for a picnics -it has an accessible playground - and Rio Vista Park for nature walks are nearby. Ten miles of beautiful trails that are part of the Rillito River Walk allow for hiking and biking, and the section accessed by 1st Avenue and River Road is even shaded in the morning. Actually, everything is near that one would need within a 20-minute ride at most and usually within minutes by car, including major city sightseeing destinations and all that the U of A offers visitors. The duplexes afford comfort, attractiveness and convenience. The photos only hint at the spaciousness and quality of the interiors. The duplex was immaculately clean, neatly landscaped and stocked with everything needed - except food if you don’t count condiments - to live there for a month. The area was safe and private and, in their efforts to continually improve the property, the owners were even in the process of installing a security gate. Cindy and Gregg are probably the best part of the rental. Cindy helped fit a water filter to their kitchen faucet and put lifters under the two front legs of the bed. She and Gregg also brought in an extra bed for my guest and fitted my bed with a cozy egg crate for sore hips. Cindy gave information and advice about the area and acted as if she were a longtime friend, while perfectly respecting privacy when no help was needed. They were both always very responsive. For example, Cindy suggested stores and restaurants and where to find a post office and mailbox close by, to name a few things. It felt very secure to be new in a city, knowing that they were so accommodating and available. With all the advantages of the duplex itself plus the caring service by Cindy and Gregg, anyone would love to stay at Pastime Suites and enjoy the quality, convenience, and superb value. Recently I stayed at Pastime Suites for a month while working at the courthouse. The apartment was clean, spacious and included everything I could ever want. Cindy is an attentive landlord who routinely checked to make sure I had everything I needed. The location is conveniant and the grounds are quiet, clean and safe. It was exactly what I was looking for. I highly recommend anyone who is looking for a longterm apartment to make Pastime Suites the first call. This apartment is close to Gem Show, Old Tucson, Sonoran Desert Museum, Tucson Botanical Gardens, University of Arizona and Kitt Peak Observatory, 4th Avenue retail district, 15 minutes from Reid Park home of the baseball spring training fields, zoo and municipal golf course. Only 3 blocks from the Rillito River Park which offers 10 miles of biking, running or walking path. Rates are subject to change until reservation is confirmed. Non smoking unit and NO pets allowed. Maximum number of people in a one bedroom is 2. Apartment is to be returned in the same condition as when rented and is to be clean. This is a quiet complex so any noise that disturbs others will not be tolerated and guest will be asked to leave immediately.